The humble rubber bouncy ball is one of those cheap and cheerful toys that for some reason amuses no end, providing many happy hours of throwing it at various things to see how much it would bounce back (the conservation of energy bit). Â Drop it on the hard kitchen floor and it would bounce back almost to your hand, whilst dropping it on the living room carpet was most unsatisfying (that’ll be the co-efficient of restitution then). Whilst merely dropping the ball from a reasonable height was fun in itself, it was even more fun if you threw the ball at the ground as hard as you could, in the hope it might bounce off the floor and hit the ceiling. They also made a game of “catchsies” much more challenging. Â Normally this was played with a tennis ball, and involved you throwing the ball at a wall and catching it when it bounced back. Â You could see how many times you could catch the ball without dropping it, and also throw in tricks such as throwing the ball under your leg or spinning round on the spot before catching the ball again. Â You could also play this on your own or with friends, taking turns to catch the ball. Â Substitute the tennis ball for a bouncy ball and it made the game much harder, as throwing the ball too hard meant it would come rocketing back at you. 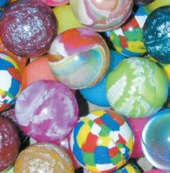 Bouncy balls are available in more varieties than you can shake a stick at, some being a single colour, others multicoloured or with a marbled effect. Â You could also get clear ones that were full of glitter or had something embedded in the middle, such as a small plastic animal. Today you can even design your own, with the aptly named Make Your Own Bouncy Ball Kit. Â It comes with moulds to make a 5cm spherical ball, or 3cm nobbly balls, which will bounce strangely when you throw them at things. Â The kit comes with five colours of plastic granules which can be tipped into the moulds however you fancy. Â Immerse in water, wait a few minutes, and pop your very own custom bouncy ball out of the mould. Â Pretty neat, huh. This entry is filed under Toys - Miscellaneous	and was posted on February 12th, 2009. You can follow any responses to this entry through the RSS 2.0 feed. You can leave a response, or trackback from your own site. I recall owning a tennis ball-sized bouncy ball and managed to bounce it higher than the house, which I thought was quite an achievement at the time. They were, however, banned at school, as pretty much everything was. I’ve got a promo one from work which they were dishing out at graduate recruitment fairs. It’s got a light up thing in it that illuminates when the ball is bounced. When said ball and it’s friends were aquired by the computing department at my work one of the naughty boys in the office decided to try it out and threw it at the floor quite hard. Ball bounced up, hit the ceiling tile and went straight through.